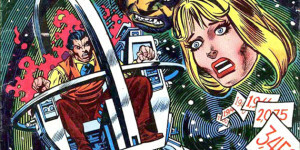 Junk Fed » Uh-Oh, SpaghettiOs! It’s no secret that I’m fond of revisiting my past. Recently, this temporal wanderlust was prompted by my taste buds. A sudden craving for one particular childhood foodstuff lured me to an aisle of my local grocery store that I don’t normally frequent these days. I narrowed my search to the canned foods aisle and scanned for culinary nostalgia. With a picture of product packaging from over 30 years in the past in mind, I nearly overlooked it. But there it was among the other canned pseudo-pastas: SpaghettiOs with Sliced Franks. I try to be conscientious of my diet these days and avoid unpronounceable chemicals or fluorescent colors whenever possible. With the red, white and orange can in hand, I paused for a moment to read the ingredients, kidding myself that the contents listed actually mattered in this case. I was going home with this can. And I was going to eat all that it contained. I dropped the SpaghettiOs into my basket and sheepishly made my way to the register hoping that any witnesses would assume I was buying it for my child (I have no children. My wife and I are wilfully childfree). This is the same hope that I lean on when I find myself in the grocery store toy aisle. As I reached the register, I began to imagine my fellow shoppers quietly judging me for feeding my imaginary children cans full of obesogens. I was overthinking it all. Realistically my imaginary children, our SpaghettiOs, and I went completely unnoticed. Back at home, I hand-cranked a can opener around the top of the can, slightly ripping the paper label, schlopped the cylindrical contents into a pan, and brought it all to a lava boil. In under three minutes, I was sitting down to a dinner I had eaten hundreds of times as a child, but this time as a 40-year-old man. I’m immediately transported to the time period shortly after my parents’ separation when I’d spend weekends with my father in his sad little apartment. We walked to the liquor store, where my dad purchased the provisions required to numb what ailed him, and then it was off to CVS for Presto Magix, and Hanna-Barbera puffy stickers. Back at the apartment, we applied the stickers to the refrigerator door. The Flintstones, Top Cat, Huckleberry Hound, Yogi and Boo-Boo all lived in harmony there, and likely remained long after my dad left that apartment. My dad cracked open his Miller Lite and began the process of forgetting, while I sat at the kitchen table with a bowl of SpagettiOs with Sliced Franks. I rubbed Han and Chewbacca transfers into their Presto Magix scenery as I ate. A small black and white television buzzed in the corner. Somehow this memory is more sweet than bitter. I have since come to recognize and resent my father’s alcoholism, but that’s a story for another time. In this cross-section, I don’t see fit to judge him. I see a very sad man trying his best to keep his son fed and entertained. His attempts were superficial, cheap, and about as fortifying as a can of processed pasta rings, but at the time, it did the trick. Eventually, My father went to live with his mother, making weekend visits far less dreary than those spent at his bachelor hovel. My grandmother was a culinary genius who was never satisfied with answers like “no thanks,” or “I’m full.” Despite her mastery of all things edible, my fussy young palate still opted for the junk. Most things from Chef Boyardee or Franco-American would do, but there was always that special fondness for SpagettiOs with Sliced Franks. These type of eats were harder to come by at my mom’s. The availability of canned goods like Beefaroni, Ravioli, and SpaghettiOs was part of what made my father the junk-food, fun-time parent. And while that might not seem so bad, it’s really not that good for you in the long run. 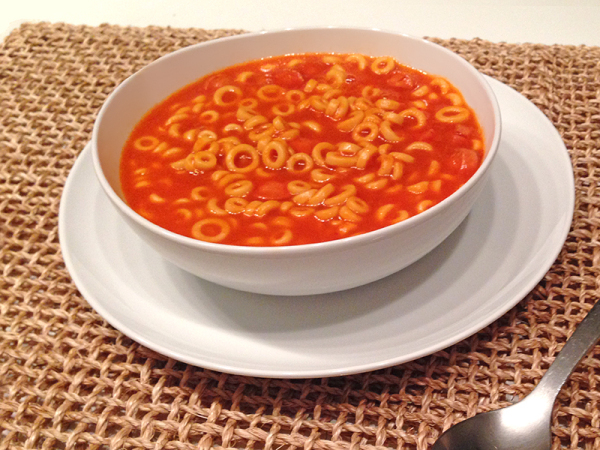 As for the taste, this is not to say that I found the SpaghettiOs especially delicious. They tasted as I remembered, vaguely tomatoey with an unmistakable hint of can. I recall most kids liking the plain or meatball varieties, but the franks were always my favorite. Once aware of my plan, my wife suggested that I might be able to concoct a healthier version using Annie’s Bernie O’s with sliced Tofu Pups. Bless her heart. 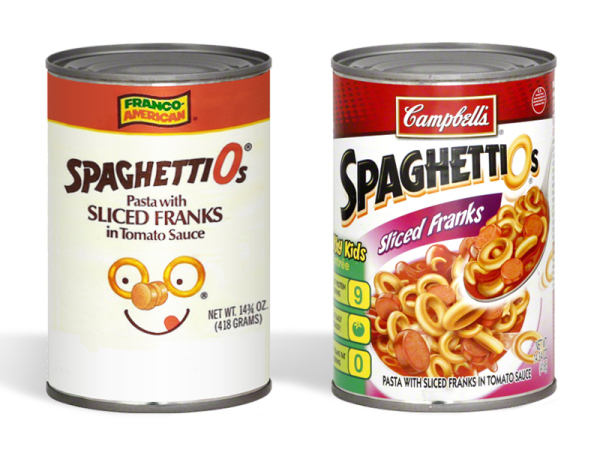 Certainly, the Annie’s canned pasta products are a near perfect SpaghettiOs replacement (without the high fructose corn syrup), but soy hot dogs are no replacement for SpagettiOs brand franks. 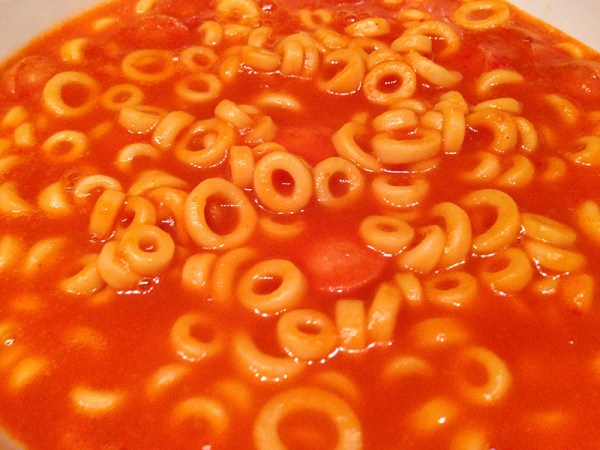 In SpaghettiOs, the buoyant little meat pucks never really tasted like hot dogs to me; rather they added a texture that perfected the dish. Sitting down to eat a bowl of SpaghettiOs as a grown man might seem like an excercise in disappointment. When revisiting the past, there’s always a risk that it won’t live up to the memories. After all, so much has changed since: the ingredients that make you who you are, and those contained in the can. But for me, the comfort in a can of SpaghettiOs had a better shelf life than I might have expected. 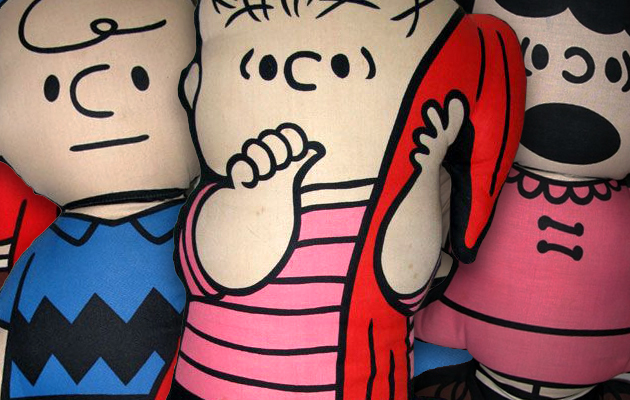 The whole thing was painfully similar to my childhood father.